The family of a 17-year-old girl who was seriously injured in a crash at the weekend has appealed for prayers and for witnesses to come forward. 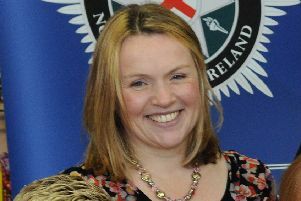 Justine McConville was hit by a car in north Lurgan and remains critically ill in Belfast’s Royal Victoria Hospital. Justine’s family has appealed for anyone who may have been in the Lake Street area on Friday evening to contact the PSNI. The St Ronan’s College pupil has a large family who have been maintaining a round-the-clock vigil in hospital. With five sisters and three brothers, Justine is a twin to her brother Justin and is a much loved member of the community. Her sister Edel said: “She is a very family orientated girl. She is very kind, caring and loves being an aunty to all her nieces and nephews. The PSNI also renewed an appeal for information on what happened. A spokesperson said: “As many of you will be aware by now, on Friday evening around 9.40pm there was a serious injury road traffic collision on Lake Street, Lurgan. Justine McConville was hit by a car and remains seriously ill in hospital. “We want to find out what happened to Justine for her sake, and the sake of her family. “If you were in the area at the time and saw either Justine or a red Citroën Saxo driving in the area prior to this, please give us a call on 101 quoting incident 1310 of 29/07/16.